Get ready for a good paddling! 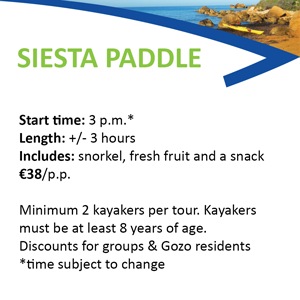 There are so many fun things to do in Gozo! Welcome expert and beginner paddlers! 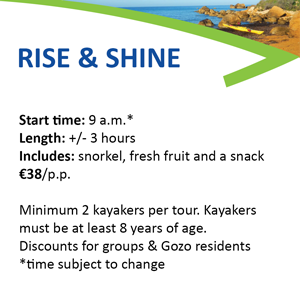 Kayak Gozo is the kayak specialist of Gozo and we're thrilled to offer you a whole new way to see Gozo and Comino islands. There's nothing more important to us than making sure you have an awesome time on Malta's gorgeous sister island. Yes, it does! Some might say that Gozo is the prettier sister, but... we like to think that they both have their own unique charms. Actually, the Maltese archipelago is made of up 7 island "sisters", although not all of them are inhabited. 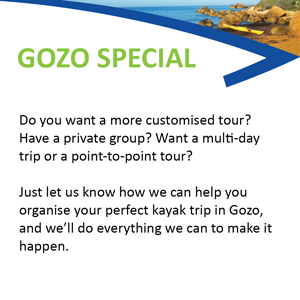 We specialise in tours of Gozo and Comino, where you can explore different areas such as the Blue Lagoon, Dwejra Bay, the orange sand beaches of Ramla and San Blas or a whole lot more! Gozo was first inhabited thousands of years ago, around 5000 B.C. Impressive monuments across the countryside tell the stories of Gozo's ancient times. For an up-close view of Gozo's history, you can visit one of the iconic watchtowers of the Knights of Saint John (like the one in the picture above). Or enjoy a fantastic view of Ramla Bay from outside Calypso Cave where Homer's beautiful mythical nymph held Odysseus as her "love captive" for several years. And of course there's the amazing UNESCO World Heritage site of Ġgantija temples in Xagħra, which is even older than the Egyptian pyramids! But the true character of Gozo isn't only in its history. The spirit of Calypso is still holding the hearts of Gozo visitors captive through the kindness of its people, its rustic, natural beauty, the magic of its clear blue waters and its laid-back love of life. Come with us and discover some of its caves, bays and secret spots only accessible by water. 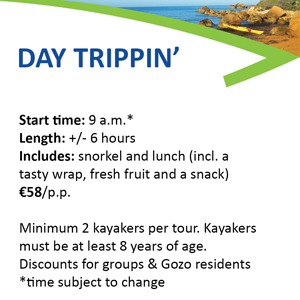 Join us for an incredible adventure exploring Gozo or Comino!